NAMM 2019: Gibson introduces the Generation Series! 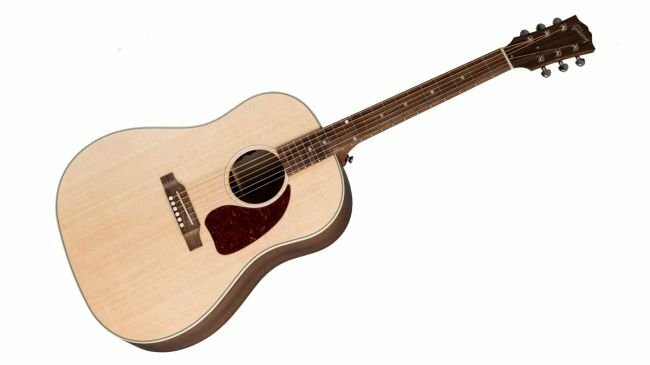 In addition to Gibson’s recently unveiled Classics and Contemporary electric guitars, the company has introduced a new series of acoustics, dubbed the Generation line. The new series is aimed at younger and entry-level players. The affordable line boasts high-quality, USA-made guitars “built by the same hands that make the J-200 and J-45’s,” according to Gibson. The first guitars to be unveiled are the G-45 Studio and G-45 Standard, priced at $999 and $1,299 respectively. Both guitars feature solid Sitka spruce tops and walnut back and sides, in contrast to the mahogany back and sides of the regular J-45. “We are very excited about the new Gibson Generation line offering the Gibson craftmanship at an accessible premium price point,” said Chief Merchant Officer Cesar Gueikian. Veiling bij Afslag! Eenmaal... Andermaal... VERKOCHT! Custom Brazilian Rosewood Martin Gitaren! Strap it up and Play! Gratis Strap bij iedere gitaar! NAMM 2019: New PRS Silver Sky Models!